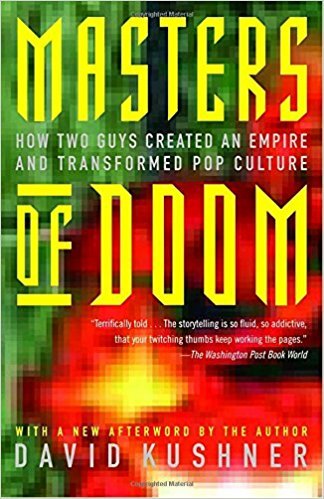 Masters of Doom: How Two Guys Created an Empire and Transformed Pop Culture - by David Kushner: - This book simple proves that both John Carmack and John Romero were geniuses who influenced the whole technology industry. It also proves that anything is possible if you are smart and hardworking. Masters of Doom. Many of us started our careers in programming because we wanted to make games. This book covers the story of John Romero and John Carmack as they created ID software making Doom, Quake, and many other games we grew up playing as kids. It's truly inspiring for any software developer. Masters of Doom is the amazing true story of the Lennon and McCartney of video games: John Carmack and John Romero. Together, they ruled big business. They transformed popular culture. And they provoked a national controversy. More than anything, they lived a unique and rollicking American Dream, escaping the broken homes of their youth to produce the most notoriously successful game franchises in history—Doom and Quake— until the games they made tore them apart. This is a story of friendship and betrayal, commerce and artistry—a powerful and compassionate account of what it's like to be young, driven, and wildly creative.